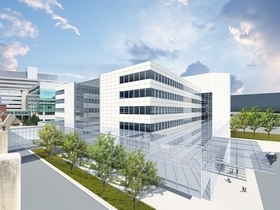 A proposed rendering of expanded facilities includes redeveloping the existing Mitchell Hospital (pictured, southwest view) and turning it into a cancer center. Despite being so busy that annoyed emergency patients often leave before seeing a doctor, a big plan that includes expanding the adult ER at University of Chicago Medicine has hit a few snags. The number of beds the Hyde Park academic medical center wants to add to the adult ER is too many, the construction tab for the nearly $270 million project too high, and the number of extra inpatient beds for overnight stays at the three-hospital campus isn't necessary. That's according to a report released today from the staff of the Illinois Health Facilities and Services Review Board. In a statement, U of C Medicine President Sharon O'Keefe said the system appreciated the board staff taking the time to review the proposal and finding that its application met more than a dozen other state standards. The nine-member board will consider the staff when it casts an initial vote on U of C Medicine's GetCARE project on May 10 in Downstate Normal. But the board, which decides the fate of healthcare projects to prevent duplicating services, isn't always swayed by its staff and approves proposals anyway. In the most controversial moves in recent years, the board has approved a handful of new hospitals despite concerns from its staff about too many empty patient beds at nearby facilities or services that weren't being used enough to meet state standards, like open heart surgery. In healthcare, doctors often talk about perfecting their craft by taking on large volumes of patients. U of C Medicine revealed its GetCARE plan in February. It's a three-prong approach to alleviate overcrowding and boost services. The proposal calls for a Level I adult trauma center (the highest state designation) long sought by activists, relocating and expanding the chronically overcrowded adult emergency room and transforming the 33-year-old Mitchell Hospital into a facility that specializes in cancer care with 188 more inpatient beds. More than 1,000 people would be hired to fill new jobs, essentially staffing a new community hospital. Although U of C Medicine is one of the busiest hospital systems in the Chicago area, the facilities board staff found that the history of how patients use the facility suggests it needs 343 traditional medical-surgical beds instead of the 506 it wants, and only 141 intensive care beds instead of the 146 requested. Even though U of C Medicine projects that its adult ER visits will grow about 6.5 percent a year through the next five years, the staff found that, based on average historical usage, the system only needs 28 ER stations, not the 41 it wants. The new and expanded ER would include four trauma beds. The construction costs also appear to be high. The state standard is about $503 per gross square foot. U of C Medicine estimated its costs to be about $618 per gross square foot. In response to the negative findings, U of C Medicine said that “responsible planning requires it to take into account utilization trends and assess future needs,” noting its beds were 90 percent full in 2015. And while the cost per square foot of the proposal exceeds state standards, a freestanding new hospital would be about $367 million – far more than the plan's renovation tab. Directors of rival trauma centers in Chicago and the Illinois Department of Public Health still must approve the trauma component of U of C Medicine's plans. The entire project is expected to be completed in June 2022. In a special report earlier this month, Crain's detailed what prompted U of C Medicine to reverse course and re-open its long-shuttered adult trauma center in an area besieged by violence and healthcare disparities. The series explored neighborhood residents' battle for the center and the political and financial calculus that drove the system's change of heart. "U of C Medicine's campus expansion plan hits snags" originally appeared in Crain's Chicago Business.